Many women don’t like to shave and prefer to use wax to remove hair from their legs, bikini area, armpits, eyebrows and upper lip. Getting a professional waxing can be extremely expensive overtime, so finding the best hair removal wax to do your own salon waxing at home can save you money and time. 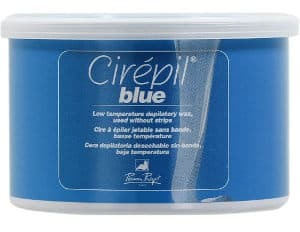 Cirepil Blue Wax is great for overall waxing and you don´t need a cellophane or a non woven strip to apply it. 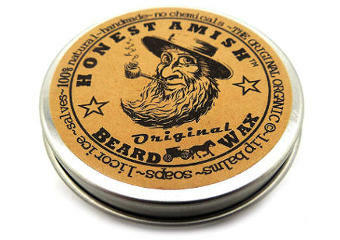 This is a low temperature wax that is disposable and comes in a 14.11 ounce tin. According to the company, it makes hair removal easier and quicker. It is easy to work with as it melts fast and goes on smoothly. It leaves your skin hair free and feeling smooth. It dries fast and is easy to peel off. Cirepil blue seems to hurt less than other types of waxes. While few users have experienced redness after waxing, it didn´t last, and most people admit that it is very gentle on sensitive skin. 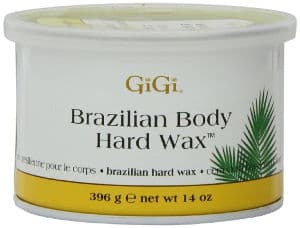 The GiGi Brazilian Hard wax comes in a 14 ounce container and although it is specifically made for bikini waxing, it is generally suitable for all delicate and sensitive areas like under arms. It causes less pain than when using soft wax. It works best when used in smaller sections. Saves you a good deal of money. Extremely effective in removing hair. 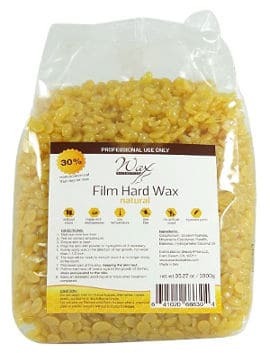 The ¨Wax Necessities Firm Hard Wax Beads¨ is a low temperature hard wax made with real beeswax and does not require the use of strips. It is hypoallergenic, free of dye and of artificial scent. It comes in 1000g bag which makes a very economical solution. It takes little time to harden and since its adhesion is strong, this wax is great for short coarse hair. While people say it is very good for sensitive skin, the company especially recommends two of their other products for more sensitive types of skin, the first one is the Azulene Beads and the second one is the Plum and White Chocolate Beads for very sensitive skin. Because these are beads, it is easy to get just the right amount of wax you need. This product is pretty gentle and remains pliable making it easy to peel off. Heats up fast and sets quickly, so it gives you less time to wait. Giving no irritation or pain. A lot easier to handle than when dealing with block wax. This is a great saving money solution. 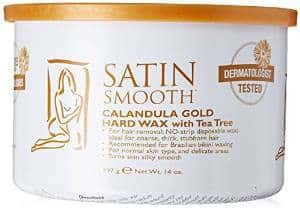 The Satin Smooth Calendula Gold Hard Wax comes in a 14 ounce container and contains natural oils (Calendula Flower and Tea Tree extract) and titanium dioxide to help the wax go smoother and be removed with less pain. It works best for thick coarse hair and is suitable for very sensitive areas. You do have to heat it in a wax warmer. It is easy to use and creates less mess than some other waxes. Users find this wax less painful and suffer less irritation when using it. 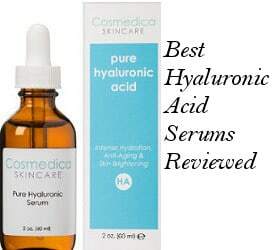 Nevertheless, some negative comments mentioned that people needed to use more of the product to get good results since, according to them, it was too thin. 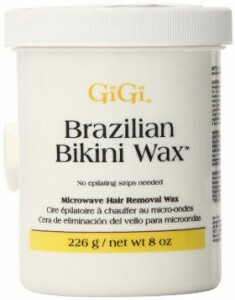 This Microwavable GiGi Brazilian wax comes in an 8 ounce container and melts in seconds. This is a gentle formula that is designed to remove coarse hairs in your bikini area but it will also work on other areas where the hair is coarser. It is easy to use and for sure much easier than using waxing strips. Works best on shorter hairs. 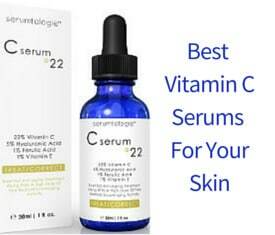 Can also be used on your underarms, lips and brows. Good on people with sensitive skin. 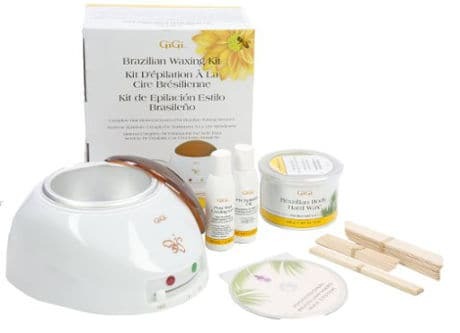 For people looking to wax for the first time, the GiGi Brazilian Waxing Kit has everything you need to get started. Included in this kit are: 1 wax warmer with cover, 14 ounces of hard wax, 10 large and 10 small applicators, 1 pre epilation oil, 1 cooling gel for use after waxing and a DVD with instructions for use. This kit is very popular among users who give it quite good ratings and reviews. So, let´s see what they think its pros are. It will save you money over those salon waxes. Works as most people expect. Less pain when you use the oil that comes with the kit. The wax warmer can be used over and over again, and different brands of wax will fit in it. In conclusion, if you are looking for the best hair removal wax, then one of these effective and good quality hard waxes can save you money and allow you to easily wax at home.